Temporary shelter made from new wood 2x4s and new steel chain. The concept for this year's sukkah was to try to make the roof covering appear to float in midair. I used unfinished 2x4s for the canted posts. 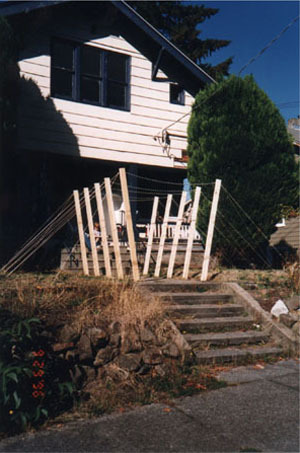 Steel chain connects the tops of the posts, tensioned by nylon guy ropes that pull outwards. Triangulation of the ropes braces the posts. While the posts and roof do appear to magically self support, the absence of enclosure not only violated traditional rules, but also left the occupants feeling rather unsheltered. Fortunately the weather this year was balmy. Materials cost about $50 and construction took one day. 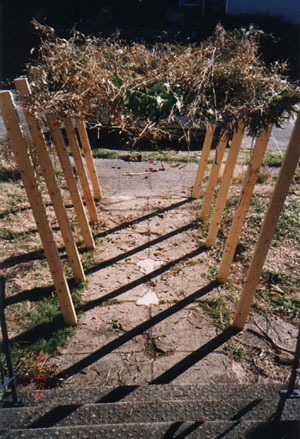 The sukkah was dismantled at the end of the holiday week and the lumber and chains were saved for future use.